One thing that has always struck me when I watch sport documentaries is the fact that many elite athletes abandon their “art” once they retire from their given sport. This is not always the case but it is prevalent enough to be considered a given. They practice religiously from their youth to their mid-30’s, retire and that’s it. They hang up their gloves, take off their track shoes, throw down the bat, doff their hats, and…. Professional sports demand a discipline, sacrifice, and commitment that not all are willing to assume. Many of our favorite athletes reach a pinnacle of performance that we see as either art or magic. They do unbelievable things that both inspire and hold us in awe. Yet when the curve of their performance begins to wobble we jeer and demand that they be sent out to pasture, stop practicing that for which they sacrificed their lives. Sport as spectacle demands new blood. You are only as good as your last game. Many athletic endeavors demand the stamina of youth for their performance. Competition demands better clock times, a .350 lifetime average, more on the win column that in the lost column. You are either better than the rest or you are nothing, a loser. No wonder that many when they retire stop practicing their “art.” Their art was tied to competition, to winning either their opponent or ever surpassing their own records. Their art was tied to the roar of the crowd. Of course, this can be said about literally anything our society puts a monetary value on. Money demands marketable results. As of late, the martial arts have also come to be judged by these sports-like demands on marketable skills: Do you have what it takes to make it in the Mixed Martial Arts. If not, your martial art is not only unmarketable but phony. 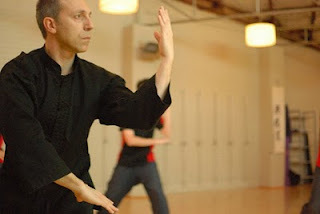 So reading Dan Djurdjevic’s essay, “Yin and yang: vulnerability, worry and martialarts” I got to thinking about whether the “hardness” and “hardship” endured in my personal capacity had the desired results. But then we have to define “results.” Did I obtain the skills to enter the ring with the MMA greats? Did it expand my cash flow? Was I able to retire gracefully amid the roar of the crowd? Obviously Dan did not have this in mind. Can I consider myself a martial artist and yet have no tangible material results as a consequence thereof? Can all the “hardness” and “hardship” endured to master the katas have a timetable? How can I measure my “success?” Am I over the hill? As my body goes, so goes the kata. The ideal kata in the brain can only be seen with the heart as the body wobbles in between. But at least I got that, I got the katas, katas which I practice with more fervor now than when young; even though with less formal decorum the youthful intention is there. The Eros and Thanatos are still at odds, yet the art remains. This I suppose is the art in the mix. An art is not a sport, it is a lifestyle, a way to see the world. It is not how you perform but what you are. Therein lies the hardness and the hardship, the “no-free-lunchiness” of it all: life. Although I am reluctant to add to a post which is already so perfect, I just wanted to say that Western society made a horrible mistake when they chose capitalism as their basis for operating. Always expecting to make profit and increase production is unsustainable, and puts tremendous demands on the planet in order to maintain positive growth. What fools we are to want to succeed all the time. Also... Your question about whether someone can be called a martial artist if they cannot express it physically... It is one that challenges my egotistic idea that "You don't understand something unless you can show it". I am glad you are in the world to share your wisdom with the rest of us! Xin...Speaking to your 2nd paragraph: there comes a time for some when the body cannot execute yet that kata of your youth remains intact in your mind and spirit imprinting on your soul a manner of seeing things.